Why care for your audio contacts? The electrical audio contacts made by the interconnects in your installation represent an often overlooked vulnerable part in the audio signal path and much harm can be done to the audio signal transferred at these points. Through frequent plugging and unplugging your contacts will start to wear. Also, the connector contacts will unavoidably start to pick up pollution and even might corrode somewhat. With polluted connectors there will be no perfect metal to metal contact; On microscale there will be some semiconductive layer in between, building a barrier for the weakest audio signals where terms as resolution, ambience and definition reside. Also through this messy non-linear contact barrier the audio signal current will start to intermodulate with the noisy ground leakage currents flowing through the shield contacts and shields of your interconnects (see further: The POLARITY CHECKER). This again will mask low level audio information. Burn in effects and directionality found with some audio cables also partly can be pointed towards polluted contacts. The metal-metal contact between e.g. the binding post and the cable connector must be kept clean and durable without any interference from the outside world. 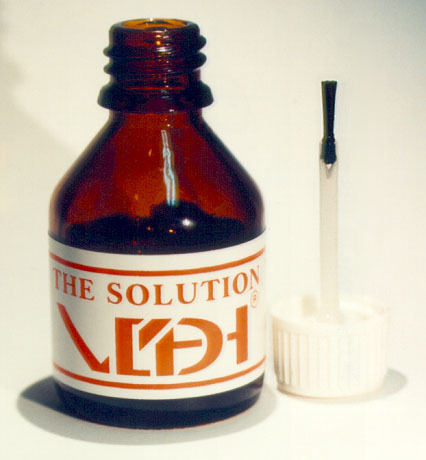 We therefore supply The SOLUTION, an ageing free contact fluid specially intended for audio applications. – Stabilising contacts against chemical attack from atmospheric pollutants. – Contact lubrication, reducing subtraction and insertion wear on the connector’s precious metals. The SOLUTION is standardly applied to all our interconnects before packing. With our RCA type connectors the fluid slips in the gap of the centre pin and spreads around after connecting in the female chassis plug. So the first treatment is already there. From experience we know that the result is time stable and helps improve the sound. The SOLUTION is supplied in small bottle with an application brush incorporated in its screw lid. Content: 25 cc., an amount that will serve you for many years. Before applying The SOLUTION on old, often used connectors, it is advisable to pre-clean their contact surfaces by rubbing them thoroughly with a piece of rough paper (never use sandpaper!) wetted with some pure alcohol (also useful to clean the heads of your cassette recorder); When looking at the piece of paper used for cleaning you can see the dirt that has come off! No copious amounts are needed. Simply wiping the lightly wetted brush along the contact surfaces to be treated suffices. The SOLUTION does not age and provides a long time protection to your audio contacts; When frequently plugging / swapping interconnects one however might consider to re-apply The SOLUTION every once in a while.